One of the joys of modern technology is the ability to simply turn a knob and — presto! — hot water flows forth. It’s made cleaning our dishes and laundry to cleaning our bodies much easier than the old-fashioned method of heating water on a stove or over a fire. We don’t often think about these appliances, so long as the water is hot when we want it. Whether you’re selecting appliances for a new construction or need to replace your current water heater, there are a few things to consider when buying a new water heater. How long does a hot water heater last? What type water heater should I choose? What size of water heater should I get? Water heaters, like every other major appliance in our homes, have a life expectancy. The International Association of Certified Home Inspectors finds an average water heater lifespan of about 10 years for a traditional storage tank type model, though that can be impacted by installation, the volume and hardness of water heated, construction quality, and preventative maintenance. As the water heater ages, it can offer clues that its time with you is limited. Rusty water, for example, can point to the water heater rusting from the inside out. Sediment building up on the bottom of the tank can lead to crash — boom — bang sounds from the water heater. The sediment, which has hardened over time from being heated and reheated, is not only damaging your water heater, it’s also making it much less efficient than when it was shiny and new. Water leaking around the water heater could be the final goodbye — though be sure to check for easily repairable leaks in fittings, connections, and overflow pipe. If you’re ready to upgrade or update your home’s hot water source, you may be surprised at how many options are available, but the most popular water heating system remains the storage tank water heater. The biggest reasons for the enduring popularity of this style is a lower cost and it keeps anywhere from 20 to 80 gallons of hot water ready to go. As water from the storage tank is used, cold water enters at the bottom of the tank so that the tank is always full. See how a water heater works for more detailed info. Storage tank water heaters can use electrical power, natural gas, propane, or other fuel sources. Electric water heaters use two heating elements, with one at the bottom and the other in the middle of the tank. 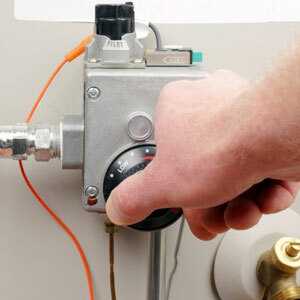 Gas water heaters use burners and heat the tank, which then heats the water. You’ll want to make sure the water heater you choose matches the fuel type available to you. While an electric water heater is usually much more efficient, its recovery rate (how fast it can keep up with hot water usage) is much slower than gas so gas water heaters usually make most sense for families and larger households. Different regions may favor different types of water heaters over others. While the storage tank means that you can have hot water soon after turning the tap, it does mean a tank will lose heat. According to Energy.gov tankless, on-demand water heaters avoid this loss of energy, but storage tank water heaters can be insulated to minimize this loss. Energy.gov recommends looking for models that have an R-value (thermal resistance) of R-12 to R-25 for optimum energy savings. Most new models will meet this level. Regardless of the fuel used, however, you want to match your new water heater to your household needs. Look at the “first hour” rating — the number of gallons the water heater can supply each hour when starting with a full tank of hot water. This rating depends on the size of the tank, the source of heat and the size of the heating element. You’ll find the “Capacity” on the top left corner of the Energy Guide label, required for all new storage water heaters. Next, you’ll need to do a little detective work. Focus on the one hour a day when you and your family use the most hot water. Is it during the morning rush as everyone is getting ready for work and school? Or is it of an evening when chores have the dishwasher and clothes washer going at full speed? It’s estimated that 10 gallons of hot water are used per shower (more for some), two gallons for shaving, four gallons for hand dishwashing and food prep, six gallons for an automatic dishwasher and seven gallons for a clothes washer. If you’re like the average U.S. family, with 2.54 people living at home, you might have three showers in the morning (that’s 30 gallons), with one shave (two gallons), and one small round of dishwashing for those morning cereal bowls (four gallons). You would have a peak hour hot water demand of 36 gallons and would look for a hot water heater with an absolute minimum of that number. Heated water expands and can lead to a build-up of pressure in your tank. The TV show “Mythbusters” demonstrated just how dangerous this can be when they turned a home water heater into a rocket. In homes where the thermal expansion is blocked from the public water supply, expansion tanks and temperature and pressure relief valves (T&P valve) both work to release built-up pressure. If you’re not sure if your storage tank water heater’s insulation is up to snuff, touch it. If it’s warm, you need to add insulation. It’s an easy DIY fix that can save you 7 to 16 percent in water heating costs. Many home improvement stores offer pre-cut blankets and jackets that will fit over the tank. Insulating the hot water pipes leading away from the tank can also reduce heat loss. This means you can lower the temperature of your hot water heater, which can save you 4 to 22 percent annually. Thermostats are set at 140 degrees by manufacturers, but most homes only need temperatures around 120 degrees. Average those out and you get what I believe to be the best water heater temperature setting of 130 degrees. When you insulate the pipes, you can reduce that another 2 to 4 degrees. Another plus? The hot water gets to the faucet faster, conserving water. Water heaters are a major home appliance and the price tag for a replacement shows that. A typical 40-50 gallon water heater will on average cost about $400-$600. That’s just for the unit. Installation may actually cost more (approx. $600-$1,000) but there are a lot of variables involved including the type of water heater as well as your region. You can quite a bit of money by installing it yourself, but you need to give your DIY skills an honest assessment. This is not a simple task. Proper installation is one of the keys to longevity for the unit you’ve just invested some significant money in. In addition, gas water heaters, for example, require a gas supply, cold water supply and flue connection that may be beyond your ability and comfort level. If so, seek out the services of a professional plumber. See more info on water heater replacement cost. Technology to improve energy efficiency — and to reduce operating costs — is making gas storage tank water heaters attractive options for energy-minded consumers, particularly for those with natural gas service available. Energy Star qualified high-efficiency gas storage water heaters can save a family of four $25 per year or more in energy costs (source). It may not sound like much, but it adds up over time. I like to think of savings from Energy Star appliances as a virtual yearly mail-in rebate without any of the fuss of filling out forms. The method of heating water in high-efficiency Energy Star water heaters is the same as standard models, but better insulation, heat traps, and more efficient burners reduce energy use by 8 percent. There are also solar energy water heaters and geothermal energy water heaters. Solar systems are most popular in the Southwest where sunny days are the norm, but these systems often require a back-up for cloudy days and nights. Geothermal requires a geothermal heat pump system and a desuperheater. Going on a cross-country trip in your RV? Be sure to read up on water heaters for RVs.